Mount Fuji is affectionately referred to as Fuji-san. Along with Mount Tate and Mount Haku, it is one of Japan’s “Three Sacred Mountains” (三霊山 -Sanreizan) and a place of scenic beauty, history, and even, superstition. Prior to the Meiji era (1868-1912), general travel was reserved for samurai and the ruling class. Most of the population, comprised of farmers and merchants, had to be satisfied with purchasing prints of famous sites. A wealthy publisher, Nishimura Yohachi, employed the artist Katsushika Hokusai to travel around Fuji creating a series of mountain images for commercial use. 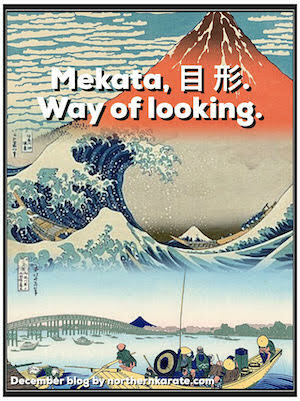 To residents who had only experienced a singular view of the great peak, Hokusai’s Thirty-six Views of Mount Fuji (富嶽三十六景 (Fugaku Sanjūroku-kei, c. 1831) was groundbreaking. Even with a plethora of descriptions and images available on the internet, we become more myopic every day. We tend to see what we want to see: red and blue, conservatives and liberals, good and bad. How much of this is reality and how much is perception? All too frequently, interpretation is fractured through a prism of experience, expectation, preference and bias. With selective sight, we position ourselves for or against a particular party or doctrine. We wholeheartedly embrace or categorically exclude entire food groups. We purchase or reject a smartphone based exclusively on logo. This tunnel-vision often applies to our martial “brand” and a short-sighted belief that one style or system is superior to another. Assumptions like “tai chi is useless,” or “all MMA practitioners are tattooed hooligans,” speak not to the limitations of these combative disciplines, but our own. It’s comforting and comfortable to cling to the familiar rather than risk the unknown. However, this distorted, restricted view leads us to miss the value of new and different things and experiences, both martial and non-martial. Mekata, the way of looking at things, requires us to remove our blinders and discard the filter that clouds our vision and to see a world of magnificent differences and wonderful possibilities.